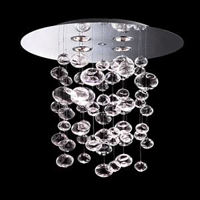 Contemporary lighting features the latest in high tech styling and finishes. Lines are clean and simple, without curlicues and fuss. Many products are more masculine in design than traditional lighting. Contemporary lighting is available with the newest finishes and glass.